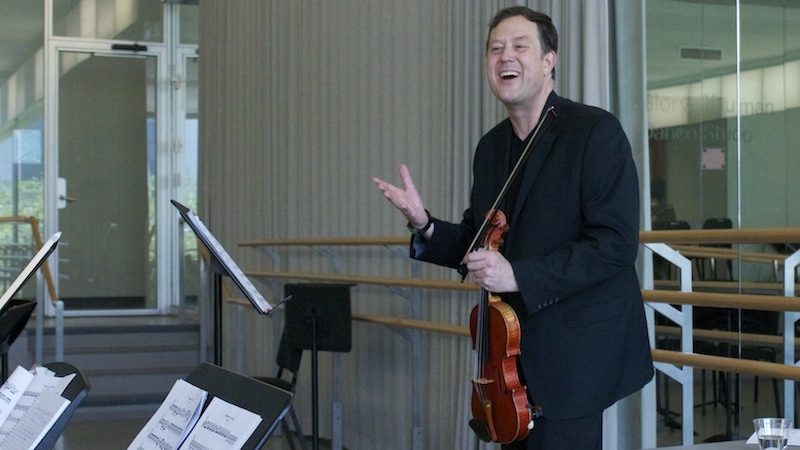 June 14, 2017, 11:11 AM · Violinist and University of Texas Violin Professor Brian Lewis has some vivid memories from playing community service concerts back when he was a student at Juilliard, participating in the Gluck Community Service Fellowship: playing for amputees; for AIDS patients during the '80s; and playing a concert in a locked mental ward, where he witnessed "a woman who had not spoken in three years, who sang 'Silent Night' with us." Bringing a group to an outreach concert also means having repertoire on hand that works, even when you don't have the ideal quartet of a cello, viola and two violins. For example, sometimes you just have four violins. What repertoire can you use, that's both fun to play and fun to hear? To that end, Lewis commissioned several works written for four violins from composer Michael McLean, who is known for his excellent violin arrangements of tangos and other music. "Sometimes it's difficult to find cellos and violas," Lewis said. "This is a way we can play without having those lower instruments." Brian Lewis. Photo by Violinist.com. The two works we studied are McLean's "Canon" and his "Preludio for Four Violins." A "canon" uses a single melody, played successively by several voices, and it harmonizes itself. A simple canon that many American children learn early in life is the song "Row, Row, Row Your Boat," typically belted out on buses, by campfires, etc. Of course, canons occur in advanced violin literature and classical music as well. "I like to work on canons before teaching the (canonic) fourth movement of the Franck Sonata," Lewis said. A number of composers wrote "Canonic Sonatas," including the well-known Six Canonic Sonatas by Telemann and somewhat lesser known Hindemith's Kanonische Sonatine, Op. 31 No. 3 (originally for flute). What are some of the challenges in playing a canon? Rhythm, for one. All parties must play with rhythmic accuracy for the musical puzzle to fit together properly. Another challenge is voicing. What parts of the melody should be brought out, so that the listener hears music and not just sonic confusion? This piece has a few techniques that students may need to work on, including artificial harmonics (mm. 35-36) and tricky string crossings (mm. 50-62). When it comes to string crossings, it can help to identify elbow positions of the bow arm. How many elbow positions are there? The logical answer might be "four": one elbow position for each string: E, A, D and G.
"There are actually 12," Lewis said. Lewis considers three positions for every string: E1 to the right of the E string; E2 on top of the E; E3 to the left of E;...and the list goes on that way, with three elbow positions for each string. Adding those positions, "you'll find you have more ways to think about weight and weight balance in your arm," Lewis said. "Ask your students, where do they think those places are?" Lewis said. Some might coincide, others may not; all are potential spots to highlight in the music. Throughout this piece is a bariolage passage with rapid string crossings over all four strings. Sounds super-impressive to the non-violinist, yet it's not difficult to play if you practice it correctly. As far as the left-hand is concerned, it's a series of mostly slow-changing chords. For the right hand, it's the same string-crossing motion throughout. Something to remember, when playing chords, is to avoid tension in the left hand. One way to minimize that tension is to be aware of how much pressure the left fingers are exerting. "What happens when you drop your hand on a table?" Lewis asked. "You don't keep pushing it down!" Similarly, when you place a finger on the fingerboard, concentrate on "having that finger there, without pressing, with only enough weight to keep it down," Lewis said. "Physical tension is the enemy of movement!" Another thing Lewis recommended for ensemble playing: have the score and use it. "Do not be a one-line player." In looking at the score, ask questions such as: "Who is passing the melody to one another? Where is the motion? Who is playing with you?" Lewis said. Also, try playing other parts, in order to be familiar with them. Lewis recommended introducing students to the study of full scores when studying Mozart concertos. For the violinist, a good way to practice following a Mozart concerto score would be to listen to the piece while following first the violin solo part, then the first violin part, then the second violin part, then flute, then oboe -- then start getting into other clefs with the cello part. Teachers need to be aiming not just to create good players, but also intelligent musicians. "Make intelligent musicians who can make decisions," Lewis said. "You are not only their taskmaster, but their guide." Dorothy DeLay provided a good example to teachers: "She was a force of nature," Lewis said. "She really got her students to think about their own artistry." If you are looking for a (much) more advanced piece for four violins, Lewis recommended Sinfonia Concertante by Ludwig Wilhelm Maurer. "Ms. DeLay loved this piece," he said, "it's like Paganini for four violins!"